Happy Thursday, everyone! I’m so bummed I didn’t get to post yesterday, especially being that it was TFD’s second anniversary! I’ll make sure to have a post celebrating that and what I’ve learned some time next week hopefully. Today I’m wearing this super comfy black tee that I’ve been living in lately. I actually have it in the green, white, gray and the black. I love it that much! It’s also on major sale right now. If you’re looking for a great and affordable black tee, I definitely recommend this one! All colors are beautiful. I wanted to wear a black on black outfit with a little hint of taupe. So, I added in my new FAVORITE booties! Ah! I love these so much. I’m bummed that it’s too cold in NYC for me to take them with me tomorrow. They’re so comfortable. I have sizing info down below, just in case you want to order them. In other news, is anyone having Instagram issues?! I’ve been dealing with huge problems since Sunday and have been freaking out. I’m hoping they figure it out soon… it’s horrible how hard it is to get in contact with them (impossible). Fingers crossed to it working soon so I can post pictures while in NYC! Just in case, follow me on Snapchat (laurenpatao) so you can follow along with me while I explore the super-duper cold city. Love the black jeans slightly ripped! I haven’t found a pair with just the right distress yet, but these are fab! These are the best! I highly recommend them. They’re the only black ripped jeans I wear!!! Loving the all black look! I love wearing all black right now. I just made the comment to my fiance that I haven’t bought anything with color for like 2 months! Happy 2 years! That’s amazing 🙂 I love this outfit – so classy and feminine. I hope you have a great time in New York, too! So fun! Happy Blogiversary, love! Love this look. Hope you have a blast in NYC. Fingers crossed your Insta snaps out of its funk. They are the best! <3 Wish I could take them to NYC w/o freezing my toes off! Happy Second Blogiversary! I love this outfit. 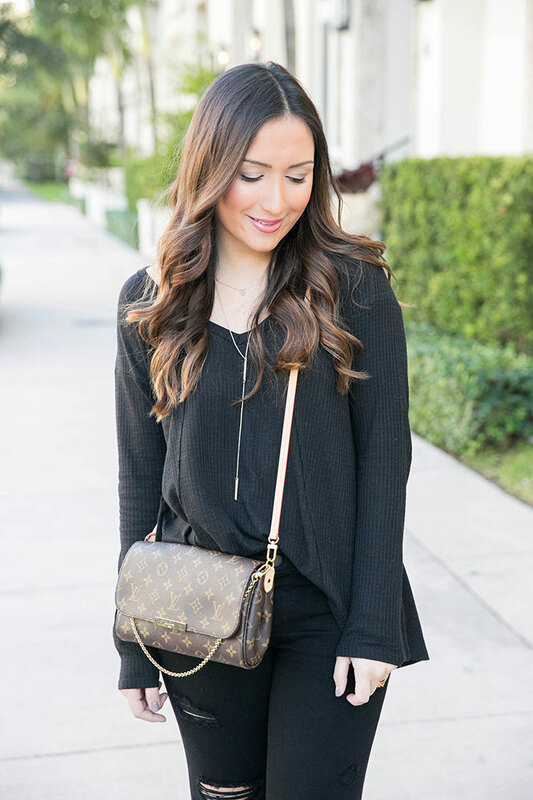 All black can be so chic! such a cute outfit! !love the all black look!!! 🙂 The booties are so fabulous! Love the bag! 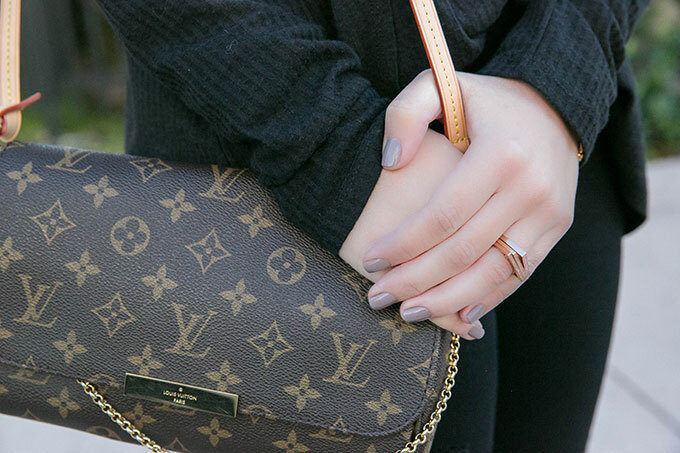 I’m on the hunt for the perfect Louis right now! Love that black tee and those ripped jeans, and those shoes are so perfect! Love this look! I’m a huge fan of all black and your booties are an adorable contrast. 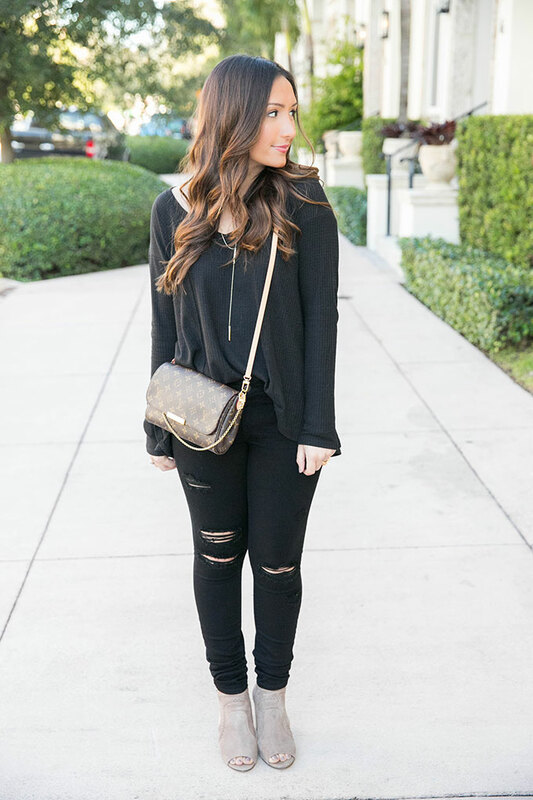 This is such a casual outfit, but the cutout booties definitely stepped it up! Love the ripped jeans! Happy blog anniversary! Those booties! My BF just ordered those for me the other day and I’m so obsessed! I love the way you paired them with all black, totally chic! Happy belated Blog anniversary! I love your posts everyday and your outfits are always perfect! Cheers to many many more years!